It will be colorful at Apple is not just the new iPhone 7 (Plus). 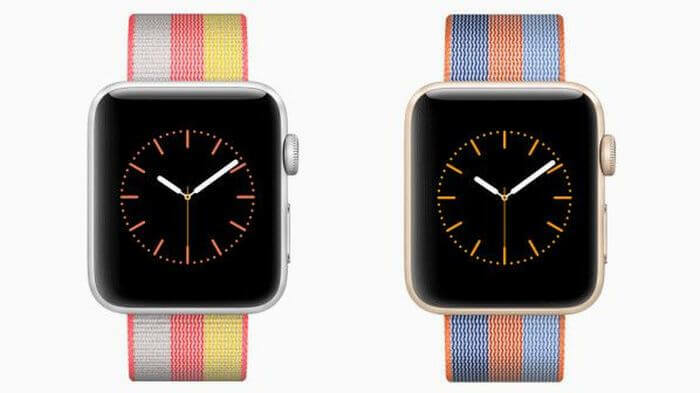 The Apple Watch family also receives a colorful increase – in the form of new bracelets. In addition to the woven nylon and leather-made watch accessories, Apple is also targeting owners of the Apple Watch Nike + with brand-new arm jewelry. The whole color splendor is with us at Awaqa to marvel. The Apple Watch needs fresh, vibrant colors. Apple has stepped strongly in the paint bucket and presented a whole battery of wristbands for its Smartwatch models from the Apple Watch series. Among other things, there are new sports bracelets, woven nylon bracelets, and classic leather variations. There are also three models for the Apple Watch Nike Plus. But it’s not enough. Four versions from a new Apple Watch collection in the Apple Store are waiting for your order. In the course of March, you can also check the bracelets before purchase with authorized Apple dealers. The prices start at 59 euros depending on the design and material quality. If you want, but can also take up to 749 euros in the hand. Oh yes! In addition to new arm jewelry, Apple has introduced new iPads, which we will introduce you in a separate place. You can also order the iPhone 7 (Plus) from the 24th of March in the red variant called Special Edition (Product) RED. In addition, there will soon be a new video app from Cupertino. For further details on “Clips”, you can also find us at Awaqa. In addition, the App Swift Playground is now also available in Europe for the first time.